My home Internet service is a dual stack setup with both IPv4 and IPv6 support. My Asus router can operate as a OpenVPN server but the stock setup only supports IPv4. 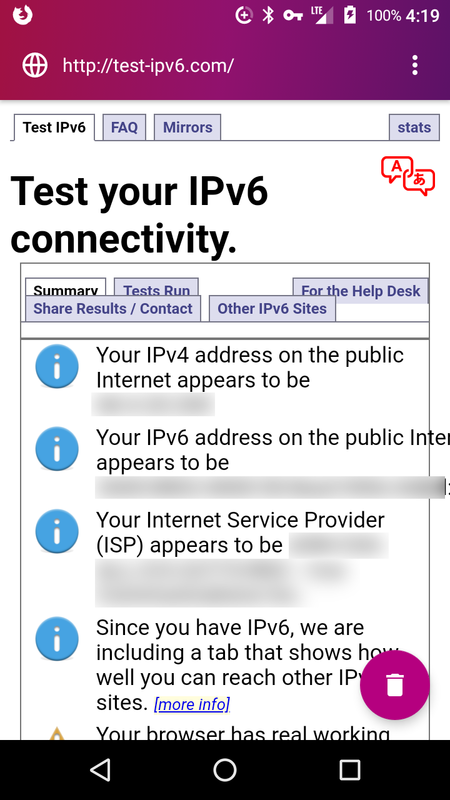 When used from a client on a another dual stack network or a IPv6 native network like T-Mobile in the United States you end up with IPv6 leaks. 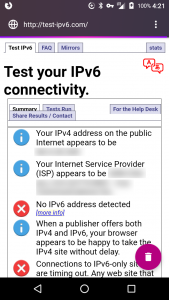 There are a number of websites where you can test your IPv4 connectivity. I used the first I stumbled on. 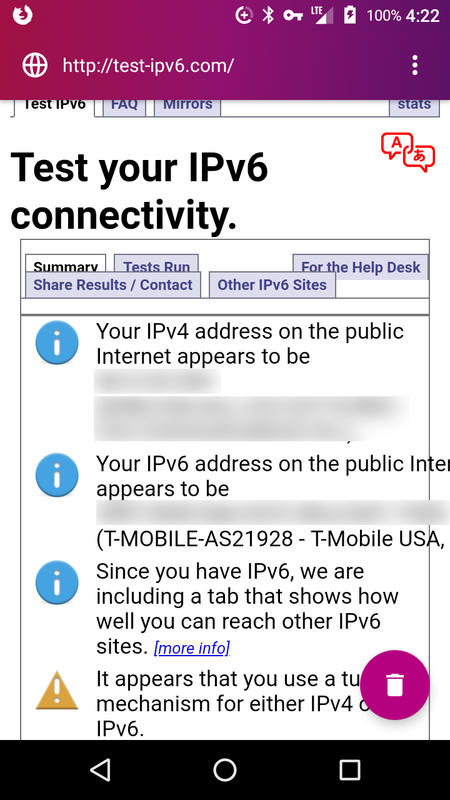 T-Mobile uses 464XLAT to support IPv4 and whatever they are doing allows the OpenVPN client on my Android phone to correctly connect and provide a tunnel. But only IPv4 traffic goes through the tunnel. 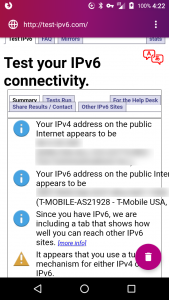 All the IPv6 traffic goes directly through T-Mobile defeating my ad blocking and reducing my privacy. The phone does not support a TAP (Ethernet type) interface, only a TUN (IP level) interface. So many of the OpenVPN examples showing a pretty easy bridge setup were not relevant. I spent considerable time attempting to get the router to transport IPv6 in a tunnel established via IPv4 and failed. 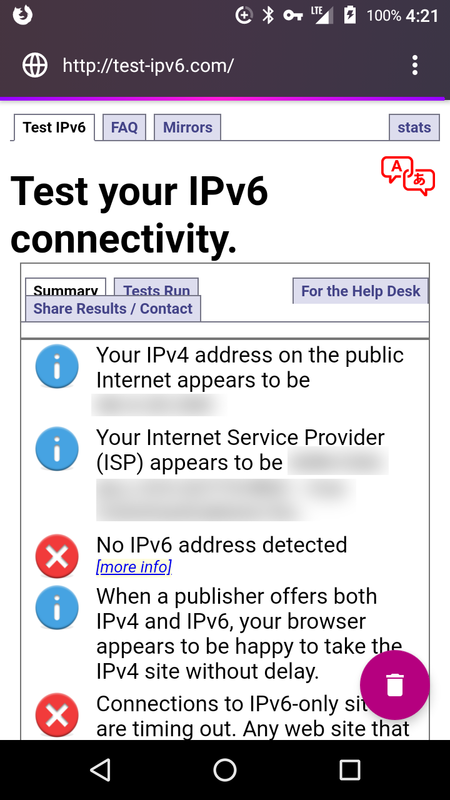 The samples I found for setting up IPv6 in OpenVPN seemed to need a separate IPv6 prefix for to allocate to devices connecting in via the VPN. I do not have a second public address prefix to use for that. In my case my ISP gives my router a IPv6 public address and one /64 public prefix range to distribute via stateless allocation to devices on my LAN. One hint was to use an arbitrary network prefix and use Network Address Translation (NAT) to access the world. Their example used public prefix which seems dodgy to me. Reading up on IPv6, it seemed that a Unique Local Address (ULA) range should be used for this type of thing. It is generally recommended to use the interface MAC address as part of the seed to generate your unique address prefix but I found a nice tool to generate an address range for me. Where “fd03:d0af:0965:9872::” is some ULA value generated from the above linked website. We are going to NAT these so it shouldn’t matter too much if they really are unique or not. Eventually I noticed that IPv6 NAT support came to Linux in kernel version 3.7 but even though newly purchased this year and running the latest available firmware, my router’s kernel was too old to support this. A quick check on the brand new Raspberry Pi, originally intended for DNS based ad blocking, showed a much newer kernel, one that supports IPv6 NAT, so I decided to try my luck there. Assure the Raspberry Pi has a static address. I do that on my Asus Router by setting IPv4 assignments based on MAC address in the LAN->DHCP Server area. Also on the Asus Router, in the WAN->Virtual Server/Port Forwarding area, forward your selected port to the Raspberry Pi. Next, install PiVPN on the Raspberry Pi. I won’t go through all the details as there seems to be many nearly identical instruction sets and basically all you have to do is select the defaults on each question. I have a dynamic DNS setup, so I use that DNS name rather than an IP address for my server. You may wish to to that too. Create at least one user and export the OVPN file to your device(s). I use OpenVPN for Android. At this time you should have a working IPv4 VPN with a massive IPv6 traffic leak. Go ahead and test it. Fortunately, PiVPN leaves all the various configuration files in the standard places. Step two, figure out what your Pi’s public IPv6 address is by using ifconfig. It will be the IPv6 address starting with a 2 or maybe 3 on eth0 (assuming you are hardwired). Again where “fd03:d0af:0965:9872::” is a ULA prefix and “public_ipv6_address_for_pi” is the public IPv6 you determined in step two. 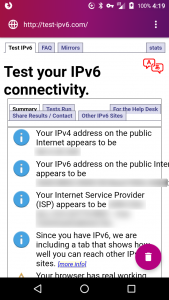 Try connecting a client to your server and see if the the IPv6 traffic and the IPv4 traffic both seem to be coming from your PiVPN sever. This setup is fragile in that my ISP sometimes changes my IPv6 /64 prefix when my router reboots. And I haven’t yet figured out where/how/when the PiVPN scripts may re-write /etc/openvpn/server.conf so a power failure is likely to break the setup. Ideally, the PiVPN scripts should self detect the local IPv6 address and correctly setup the ip6tables and /etc/openvpn/server.conf file. In addition it would be nice if it generated the ULA for the VPN using the official RFC procedures with a MAC address on one of the Pi’s interfaces rather than relying on an arbitrary website. For the moment I am leaving that as a future exercise. If this VPN breaks because of a IPv6 prefix change I can still use the VPN on my router. If you are worried about your ISP changing the IPv6 prefix, I guess you could setup crontab to run this periodically.